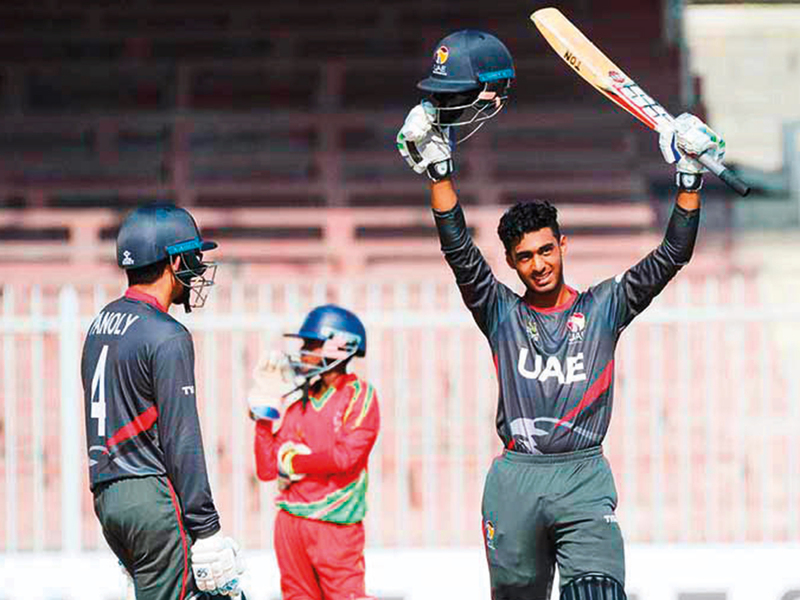 Dubai: The UAE won by one run over Nepal through the Duckworth Lewis method as rain stopped play in the ICC Asia Under-19s World Cup qualifier at Kinrara Academy Oval ground in Kuala Lumpur. The UAE were chasing Nepal’s 247 in 50 overs and were 122-3, needing another 126 runs from the remaining 20 overs, when rain stopped play. Ansh Tandon and Vriitya Aravind had put on a 101-run partnership in 25.2 overs. Tandon cracked 54 runs off 85 balls with four boundaries before being caught and bowled by Sagar Dhakal when rain intervened. Aravind remained unbeaten on 47 off 82 balls with four boundaries. Fortunately for the UAE, their total was just ahead of the D/L method par score when rain ended the play. Nepal, put in to bat first, lost their opener Pawan Sarraf in the third over when Mohammad Farazuddin had Sarraf caught behind by wicketkeeper Vriitya Aravind for 12. Opener Rit Gautam and one-drop Aasif Shaikh put on 47 runs for the second wicket when Rishabh Mukherjee struck to pick his first wicket of the day. He had Shaikh caught by Farazuddin for 27. Mukherjee removed Nepal skipper Rohit Paudel for 18. Soon Nepal were struggling at 115-5. Hari Chauhan and Bhim Sharki pulled Nepal out of trouble through a fighting 92-run sixth-wicket association. Palaniapan Meiyappan ended the partnership in the 43rd over by dismissing Sharki, who scored 53 off 54 balls with four boundaries and two sixes. Chauhan remained unbeaten on 67 runs off 74 balls with seven boundaries. Chasing the score, the UAE lost skipper Aryan Lakra to the last ball of the first over when he got run out soon after he hit a boundary. Opener Syed Haider, who was the hero of their first match win against Malaysia through a knock of 62, fell in the fifth over for 11. Ansh Tandon and Aravind then put on the century partnership. Tandon cracked 54 runs off 85 balls with four boundaries before being caught and bowled by Sagar Dhakal. Immediately after Tandon’s wicket, rain stopped play. The UAE play Kuwait on Monday. UAE bt Nepal by one run D/L method. Nepal 247 in 50 overs (Rit Gautam 44, Aasif Shaikh 27, Hari Chauhan 67 n.o, Bhim Sharki 53, Mohammad Farazuddin 3 for 52, Rishabh Mukherjee 4 for 64) UAE 122 for 3 in 30 overs (Ash Tandon 54, Vriitya Aravind 47n.o). Player of the match: Hari Chauhan.